As a child we read picture books and watch animated movies where the colors are so bright and the images so smooth--Where everything feels light and whimsical and pleasant. But all of the images we take for these fantasy worlds are from our reality. 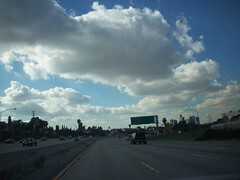 The clouds in the sky can be as fluffy as the ones in the simpsons intro or the Care Bear's whimsical city. The moon is as crisp as the storybooks about Santa flying across the starry night sky. So, what an amazing thought----to think that we live in a "picture book" world, where everything is at our fingertips, and anything is possible. We can fly in the sky, we can have a fairy tale romance. Sometimes the world is so beautiful I can't take it. I am almost done with my Vlaze Music "Best" clips series. It's going to be a round-up of the best music clips from this year. I have a new favorite in this live performance by People in Planes shot in May of this year. It is amazing. Take a look.